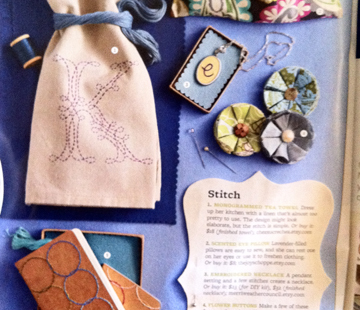 I’m so excited that one of my embroidered initial necklaces is featured in the November issue of Better Homes and Gardens! 1 entry = mandatory first comment please sure sure to include your email address. 1 entry = Tweet this blog post using the link below the post! 1 entry = visit my facebook page and push the like button! leave a comment with you fbook name! 1 entry = subscribe to my newsletter! (see sidebar) and leave a comment with your email address. Enter anytime between now and Halloween and I’ll announce the winner November 1st! Oh, Danielle, that’s way too cool! I can imagine your happy dance, lol, and what time to celebrate! Don’t include me in the drawing, but I just wanted to say an official CONGRATSSSSSSSSSSSSSSSSSSS!!!!!!!!!!!! congrats!! curious…..how is it that you got published with them? i’d love the story!! Congrats and thanks for the story! I can only imagine the excitement and jubilationat pulling it all off. I follow you by RSS.